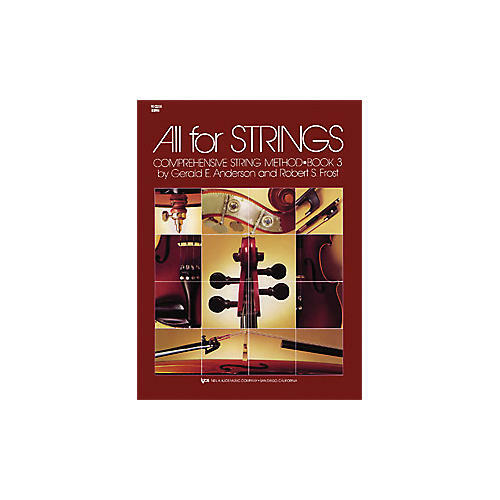 All for strings is a comprehensive three-volume method surrounded by a wealth of supplementary materials for teaching and performance.This complete curriculum covers virtually every aspect of beginning through intermediate string study, emphasizing technical skills, rhythmic understanding, and quality musical experiences. Many of the National Standards for Music Education can be easily implemented into the classroom setting with the varied components All for Strings has to offer.Book 3 focuses on left-hand shifting and upper position work for each instrument, and includes step-by-step shifting instructions for both students and teacher. Intonation builders, vibrato exercises, harmonic studies, syncopation trainers, spiccato etudes, and a variety of new rhythm exercises are included to round out this comprehensive approach.